The interaction between the paint and the image it represents – and therefore its meaning – is essential in the paintings of Casper Verborg (1981); just as the interaction between the painting and the viewer. Painting is a visual medium, which means that it always represents something outside the painting itself. A painting is not only an image; it is a statement about the paint and the act of painting. In Verborg’s paintings, two main themes can be distinguished: the face and the narrative. A figurative painting is in fact a narrative by nature; everyone is a storyteller, so when confronted with an image, you start to naturally create a narrative around it. When looking at a portrait (or a painted face) you will start to wonder: what is going on? What is he or she thinking about? 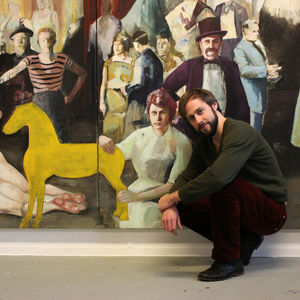 The most recent work of Verborg is a visual search for the (im)possibilities of narrativity in the field of painting. The stories given to his paintings might stir equivocal feeling; there remains a big difference between the paint and the image it represents. Can these two go along together? Seeing a (narrative) picture as an evolving situation might seem natural, but at the same time there remains a persistent gap between the picture and the narrative it entails. Despite the apparent connection between the narrative and the painting, there is an inevitable disruption between the two of them. In the eyes of the beholder, the paint moves back and forth between the representation and the gesture. The painting gets an animated appearance, and thus will open from an image towards the medium-specific qualities of painting.